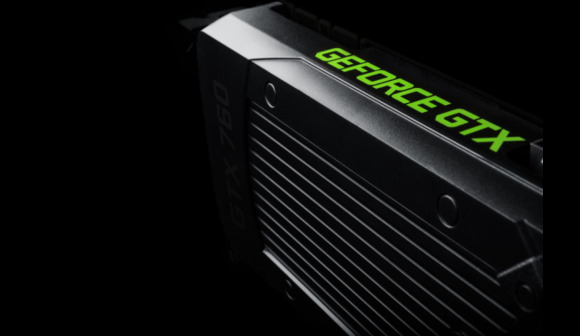 Barely a week has passed since AMD announced that it isn’t bringing the popular “Never Settle” free gaming bundles to its new(ish) R7 and R9-series graphics cards—at least not yet—and Nvidia is already seizing the opportunity. At an event in Montreal Thursday, Nvidia announced the details of its 2013 Holiday Gaming Bundle, which gives you free triple-A games and discounts on Nvidia’s Shield gaming handheld when you buy GeForce-brand graphics cards. The number of free games and size of the discount depends on the oomph of the hardware you buy, however. You’ll need to buy a $1,000 GeForce Titan, $650 GTX 780, or $400 GTX 770 to receive the biggest bundle. Splurge on one of those beastly cards and Nvidia will toss in a free copy of Splinter Cell: Blacklist, Batman: Arkham Origins, and Assassin’s Creed 4: Black Flag, along with a $100 discount voucher towards the $300 Shield handheld. But what if you don’t need that level of firepower? Buyers of the 1080p-capable, $250 GTX 760, or its older GTX 660 and 660 Ti cousins, receive Splinter Cell and Assassin’s Creed along with a $50 Shield voucher. Cheaper cards get nada from the Holiday Gaming Bundle, alas, though Anandtech says that $140-ish GTX 650 series cards will continue to come bundled with $75 of in-game credit towards Warframe, D&D Neverwinter, or Marvel Heroes as part of Nvidia’s Free to Play bundle. 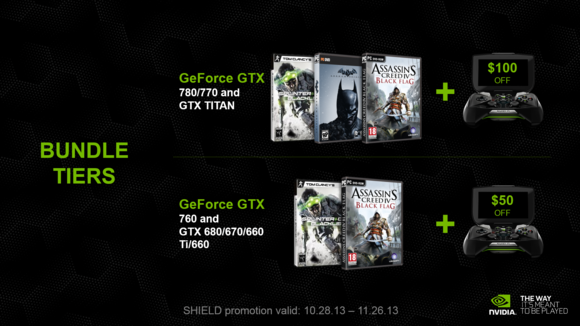 None of the triple-A Holiday Gaming Bundle titles would run well on a GTX 650 anyway, to be honest. Those are all mighty enticing deals for would-be gamers, though Nvidia’s Holiday Gaming Bundle isn’t the only show in town. While the R7- and R9-series cards are persona non grata, AMD’s still running its “Never Settle Forever” promotion with its Radeon HD 7000-series graphics cards and it’s offering a much wider selection of titles to choose from, including hits such as Far Cry 3, Saint’s Row 4, Tomb Raider, Deus Ex: Human Revolution, Sleeping Dogs, and more. AMD’s games aren’t as new as Nvidia’s, however—and picking your free game bundle is a game unto itself. But on the other side of the coin, you can find some suh-weet deals on Radeon 7000-series cards right now, as AMD and its partners clear inventory to make way for the new hardware. Team Red or Team Green? It doesn’t matter. Right now, the flood of free games is making it a great time to be a gamer on the hunt for hardware.